Being a Vegetarian I still occasionally miss certain things that I used to enjoy…like Chicken Noodle Soup. And, lately I’ve been experimenting with going Gluten Free. So Chicken Noodle Soup seemed to be something that was out of the question… Until now… I decided to make it happen. I made Vegetarian Gluten Free Chicken Noodle Soup that was amazing! Here is how I did it. I used Quorn Chik’n Tenders, Jovial Gluten Free Spaghetti and Pacific Brand Vegetarian Chicken Broth. I added sautéed onions and shitake mushrooms and a diced potato and a little poultry seasoning. 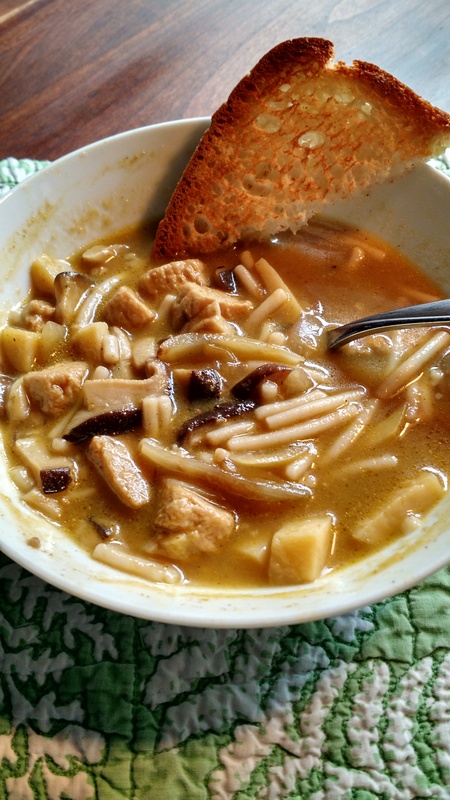 And I created the best Vegetarian Chicken Noodle Soup… Here is the recipe. Great with a little Udi’s Gluten Free Bread toasted and topped with butter.Please share with friends and tell them where you got the recipe! Add half a bag Quorn Chik’n nuggets and Saute till slightly cooked and then cut each piece in half. Pour Vegetarian Chicken Broth into a saucepan and add the above ingredients. Add 1/4 tsp poultry seasoning and a little salt and pepper.Cook for 20 minutes . Grab a very, very small handful of spaghetti. About the size of quarter round. Break spaghetti into 1 inch pieces and throw into soup. Cook 15 more minutes. Remember that the spaghetti will swell so you don’t want too much… And you are done! Enjoy!